Talks between French President Emmanuel Macron and US President Donald Trump are expected to be held in Paris at the end of the week. “Nice couple”will spend together July 14, the Bastille Day,as well. Tsargrad will tell what can be expected from the meeting and what signals Washington sends. Emmanuel Macron "pumped his muscles" to the G20 summit and he is mentally preparing now for a meeting with the American president tête-à-tête. Of course, the presence of Chancellor of Germany Angela Merkel is important, but the main attention will be paid to the relations between Paris and Washington. It will be the fourth meeting between Trump and Macron after the NATO summit in Belgium, the G7 in Italy and the G20 in Germany. According to the White House, Donald Trump "is going to confirm the strong ties of friendship between America and France." 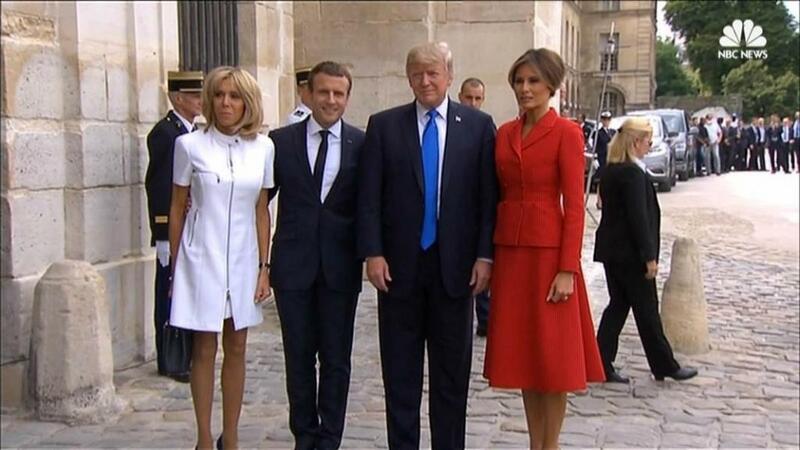 Trump and Macron started their meeting visitingHôtel national des Invalides, Musée de l'Arméeand the tomb of Napoleon. Perhaps, they will also visit the American military cemetery in the Suresnes commune. Then, theydiscussed the painful topics and gave a press conference at about 16:45, Moscow time, in the Elysee Palace. And July 14 will be more symbolic day for both Paris and Washington. It is a coincidence that there will be a military parade (from 10:00 Moscow time) in honor of the Bastille Day, and the 100th anniversary of the US joining the First World War on the side of the anti-German coalition. Moreover, it is also a tragic anniversary of the terrorist attack in Nice. The separate event dedicated to this tragedy will be held at 17:00, Moscow time. It is well known that any political meeting has its clear symbolic signals. In this case, it is undoubtedly a military issue. Besides visiting the historical sites associated with the army, Trump and Macron will visit the military parade on July 14. two F-22 Raptor fighters and six US Air Force F-16 fighters will fly over Paris. As Reuters writes, this is not only a celebration, but also a chance to show Trump the military training of the French. Although France has not fulfilled the NATO request to provide 2% of GDP for military spending, "Trump is satisfied that the country is close to achieve the goal." Simply telling, Macron's task is to demonstrate loyalty and obedience. During the first meeting, Macron shook Trump's hand so hard that it brought about funny memes on the Internet. However, Macronhas an opposite view: he allegedly demonstrated that he was not going to "make concessions, even symbolic ones." But it looked very clumsy, and now he has to bow. According to preliminary data, the main topic of the talks will be the war in Syria and the fight against terrorists. It seems to be clear to everyone what will be discussed in this block. If Syria's questions are still capable of provoking disputes between Western leaders, but fighting terrorism is a convenient topic for the leaders to findunity and harmony in opinion. However, despite the threat of terrorist attacks, Macron is going to cancel the regime of emergencies in France, so he does not intend to take care of security inside the country. Some contradictions might appear during the discussion of Qatar, the main sponsor of terrorism. Macron supports friendship with Qatar. The day before, he held talks with the Emir of Qatar, Sheikh Tamim bin Hamad Al Thani. President of Turkey RecepTayyip Erdogan, President of Iran Hassan Rouhani and King of Saudi Arabia Salman bin Abdul Aziz Al Saud also participated in the talks. As for Trump, he is not a simple person. Firstly, the American president saidopenly that Qatar was a sponsor of terrorism, and then the US signed a memorandum of mutual understanding in the fight against terrorism. It's funny to note that the crisis around Qatar was initiated by the US itself. The mess happened right after Trump's visit to the Middle East, and now the problems are slowly being resolved, because they signed a $ 12 billion deal to buy 36 F-15 jets from the U.S. Also, agreements on liquefied natural gas and even football create one more intrigue. The second, even more inconvenient topic is climate. As we remember, Trump announced that he would withdraw the United States from the Paris climate accord. Macron still hopes to convince him not to do it. Previously, he even joked, calling “make our planet great again”. The Paris accord is a balance of economic and geopolitical interests, and it was achieved with great difficulty. In any case, it affects both the interests of national elites and transnational corporations. The idea is that developed countries share money with developing countries andreduce the amount of emissions. The purpose of the agreement is to keep the growth of the global average temperature below 2 ° C, if it is possible – below 1.5 ° C.
However, all these good initiatives raise great questions in the scientific community. Tsargrad also wrote about this before. We are facing sharp temperature changes; the number of unforeseen cataclysms is growing. Trump is unlikely to compromise - it is economically unprofitable. And for what reason, if the promised warming is not expected? To sum up: Macron tries a lot to look like Jupiter and create an image of the leader of a militarily strong country, however,he has looked very weak so far. Because the real master of France is still Washington and the upcoming meeting can be regarded as a visit of the American controller.